The danger is increasing for Grianne Ohmsford, rightful High Druid of Shannara, who has been banished to the harsh world called the Forbidding by a treasonous fellow Druid. Her only hope for rescue is her nephew Pen, but Pen is under siege as well. Both he and his parents are sought by the Druids, who want to make sure that their magic will never help Grianne to return. Yet no one but Grianne is aware that her banishment into the Forbidding allowed the simultaneous transference of a fearsome denizen of the Forbidding back into Grianne's world, an evil creature that can take on any shape, can kill at will, and is only the harbinger of a much greater, devastating invasion. This narrator does not seem to have the experince of Scott Brick who did the first in this series. It makes it hard on the steady listener when they switch in the middle of a series. This is even worse when they switch to someone not as good as the first. As always, Terry Brooks has managed to build new pieces into a world both dark and inviting, pieces that add to the world's magic and mystery in a way that few can. The events story as it exists has become so far removed by time and events from the first story that they're barely recognizable as being the same, but still believable as the same world nonetheless. That said, I found the narration to be disjointed and distracting. The speaker made poor attempts at distinguishing one voice from another, and at times would shift "voices" amidst a sentence, making dialog more difficult to distinguish from the rest. He has the voice and stylings of one well-suited to children's stories, of which this is definitely not one. Scott Brick brought me to Terry Brooks, but Terry Brooks kept me listening... this narrator does just fine. He is not Scott Brick, but few are! If you read book one, you will love the continuation, as it is not over... in fact, I will be amazed if this is concluded in one more book! As aways, a great listen! Once Again, Terry Brooks has drawn us into the Four Lands, and now The Forbidding, with powerful images and intricate plottings. The relationships between enemies and comrades, men and nature, are well thought out and tightly constructed. I wish I could say the same for the narrator. The reading is adequate to convey the basic feelings Mr. Brooks is trying to evoke, but just barely. I found that the dramatic range of Mr. Boehmer was lacking, and he resorted to awkward voicings for inhuman charcters that were more distracting than menacing. Scott Brick has done an outstanding job of bringing power and finesse to the world of Shannara and it's denizens thus far, and it is disappointing to lose the mental pictures of the characters that we, the listeners, have built in our minds in previous books in the series. It is especially galling that the change in narrators has been made right in the middle of the High Druid story arc. It has taken away from the experience of this newest volume. You find yourself constantly comparing the readers instead of being drawn into the story. If the final volume of the series, Straken, continues with the current reader, I don't see myself listening to it. I'll read the book and let my imagination do the rest. I love the story and the plot but the narrator is the worst I have ever heard. My suggestion, go buy the paper copy and read it yourself. I read the entire Shannara series years ago when first published and now listening to them on audio makes them come all alive. Can't wait to listen to the newest entries Armegeddon's Children and The Elves of Cintra. I am a big Terry Brooks fan. I've not read the entire set of the Shannara series, but I did read the trilogy just previous to this. 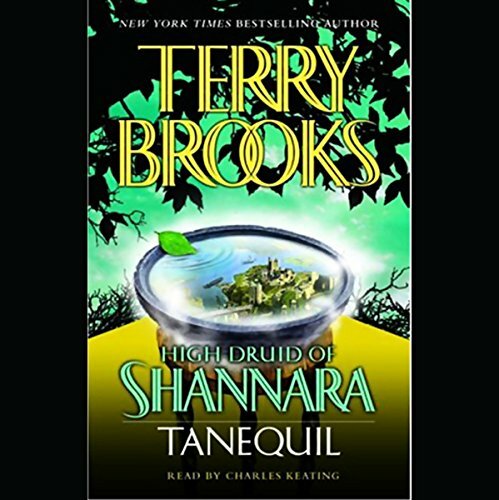 I've listened to both Jarka Ruus: High Druid of Shannara and book 2. Both excellent to listen to and, IMHO, much easier to follow than reading them. I've read all the terry brooks books since being a little kid. I was entranced with sword of shannara and enthralled with elfstones. I read the entire series, but since the voyage of jerl shannara Brooks' stories have become stale and uninspired. I find myself losing interest in the story and/or knowing what is going to happen next. I am getting a really strong feeling that all these books lately have been written just to fulfill a contract obligation and put money in the bank. All of the characters have the same personalities, and events play out in a completely expected almost cliche way. Brooks' books just dont have their passion anymore. I read Terry Brooks all through high school and college. I hadn't seen anything recently. My father got me the 1st book in this series for mothers day and I couldn't wait to read the next book. Luckily I found this site and was able to fill my long commute listening to this wonderful 2nd book. I'm glad to see Terry Brooks can still pull me in. Very vivid details, plotlines, and twists. I didn't hear the first narrator but I think this one did just fine. I can't wait for the next book to come out!!!! This is a definate listen if you've heard/read the 1st book. I wish that Scott Bricks had continued this series. His voice and expertise pulled me into the world of audiobooks. I agree with the previous reviews that Paul Boehmer does not sound as good as Scott Bricks but he is no slouch either... Having heard a few samples from other books (some of the sherlock holmes come to mind) I would have to say he does a fairly decent job. It would have been even better if the sequence of readers had been switched going from Paul and finishing with Scott.